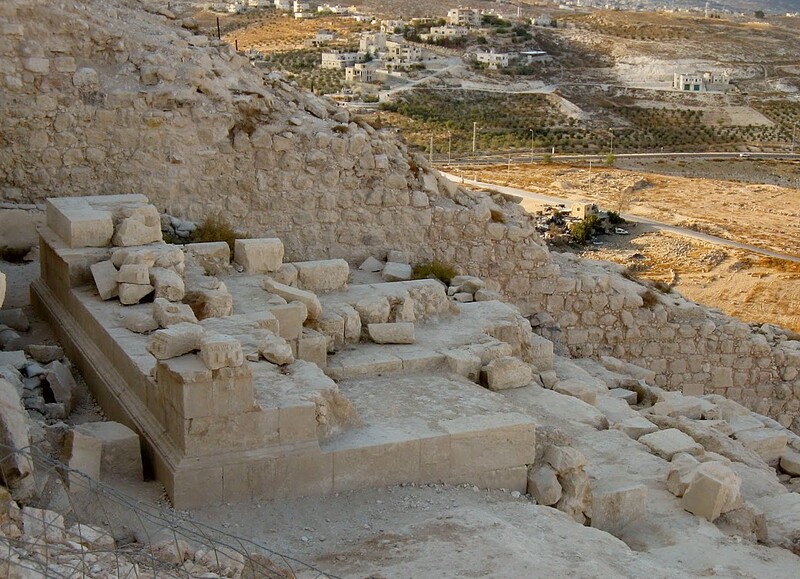 In May 2007, Ehud Netzer (of the Hebrew University, Jerusalem) announced to the world that after a lifetime’s search, he had uncovered the remains of Herod the Great’s tomb (BBC coverage; London Times story). The likely site of the tomb – Herodium – is a man-made fortress of immense scale with many buildings, monuments, trackways and open spaces. Herodium is located in the West Bank some eight miles from Jerusalem. Excavation at the site has attracted criticism on ethical grounds. Were Israel signatories to the Second Protocol of the 1954 Hague Convention, the project would be illegal under international law. The second protocol forbids excavation and disturbance of archaeological remains in occupied territory. Israel is not a signatory to the Second Protocol and so the excavation has continued. The site is now well excavated and extensive survey has allowed archaeologists to reconstruct much of the city’s layout. Previous attempts to find Herod’s tomb have so far led to the discounting of likely locations as season after season the excavators drew a blank. Herod was a controversial character to say the least! He was highly unpopular amongst the local population. The site of Herod’s Tomb is reported by the Jewish historian Flavius Josephus as being in Herodium (and this seems likely – the place is as much a monument to himself as it is a fortress). The Jewish Revolt (beginning in 66 CE) encompassed Herodium and most probably led to the desecration and destruction of Herod’s Tomb. This would make its discovery by archaeologists two thousand years later extremely difficult. The primary evidence presented by Netzer for Herod’s Tomb are ten fragments of the carved limestone sarcophagus. The chamber in which the fragments were found gave no clues as to who was buried there. Would Herod’s tomb not be lavishly decorated? Perhaps all of this was destroyed in the Jewish Revolts? The fragments themselves are clearly decorative, and come from some substantial piece of stone. They do look like the kind of decoration seen on the side of a high-status sarcophagus. However, there is little evidence from which to assert that this proposed high-status sarcophagus belonged to Herod himself. To make that assertion you need more than ten fragments of pretty stone. There were no human remains found with the fragments and so the tomb hypothesis must have other corroborative evidence. 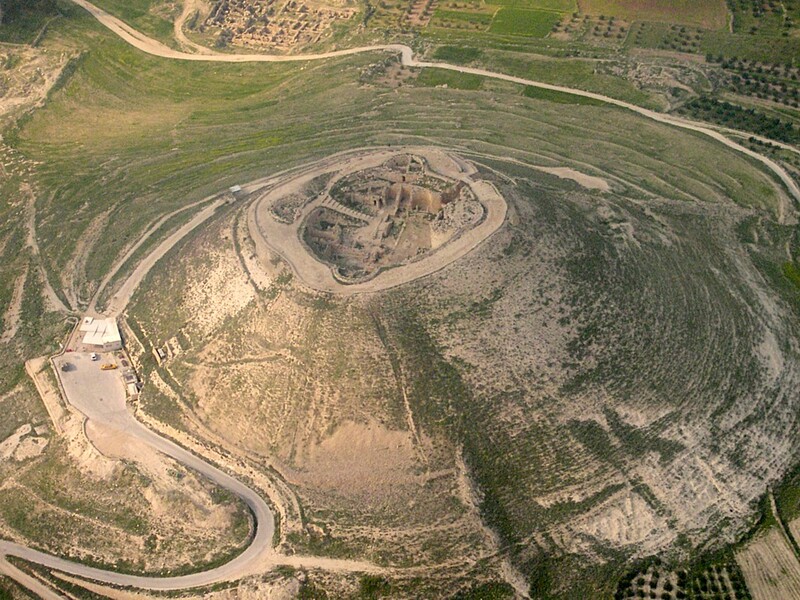 Netzer offers the tomb’s location within Herodium itself. The location of the tomb-site needs to be explained in the context of the rest of Herodium. Netzer follows the description of Herod’s funeral by Josephus and builds his case accordingly. Netzer claims the burial chamber in which the stone fragments were found is the burial chamber of Herod himself. In order for it to be a suitable burial place for Herod the following two assertions were made: what was previously thought to be a Hippodrome was actually a funeral procession-way; and there was a podium built to support the body of Herod prior to its entombment. The funeral procession-way led to the base of a monumental staircase, the podium being reached by alighting the monumental staircase. Unfortunately, there is no more evidence for the grand linear structure being a funeral route than there is it being a hippodrome. Secondly there is little evidence to support the claim that this podium had anything to do with the death of Herod. Such a claim is pure speculation. A lifetime spent looking for something historically important (like something described in classical texts) can foster high expectations of eventual success. Unfortunately there is currently no conclusive evidence that anyone has identified the tomb of Herod the Great. Given the turbulent history of the region it is unlikely that conclusive evidence will ever be found. The claims of Netzer and his team are based upon flimsy evidence but we (like him) live in hope that better is to come. I can’t really speak for James, who wrote this page, but I would say that we don’t discriminate against professional archaeologists: we professionals are every bit as capable of doing bad archaeology as amateurs and hoaxers! I can’t see why your being a Jewish Israeli could be a problem for either of us: it’s great to be able to reach an international audience. I suspect that James’s objection to the original stories to which he linked was that an historically important site was alleged to have been discovered on the flimsiest of evidence. There’s nothing at the site to say that it was a tomb or that it belonged to Herod: in my opinion, Professor Netzer is entitled to make bold claims, but he really ought either to bolster them with good evidence or to put in lots of caveats about it being pure speculation (which, ultimately, is what it seems to be). I think that the political issues are something that interest James more widely and involved part of his PhD research. Thanks for the compliment on the site! I’m afraid that it got classified under “Religious delusions” because I couldn’t think where else to put it! I agree with you entirely that Herod is hardly a hero for the Jewish people. As I said before, I can’t really answer for James, who wrote the article. I agree, it does boggle the mind as to how this project gets included with bad archaeology. If Netzer’s work is bad archaeology, all archaeology is bad (it certainly is destructive) and it might be worthwhile to just call it a day and retire the url. The site is now the subject of a major, and controversial, exhibition. That would perhaps suggest it is better placed under the In Service of Politics section of this site. Also, note the tone of the news piece linked below – I don’t know if the writer is an archaeological specialist, but there is no hint that the findings might not be as substantive as is being claimed. Whatever, the bible has shown for centuries to be trustworthy, if not, it couldn’t have intact survived hordes of skeptics much more prominent, renowned and talented than that paltry unknown author…. The bible has been shown to be far from trustworthy on any subject that can be tested independently. To claim otherwise is to be blind to evidence. Insulting James (“paltry unknown author”) doesn&rdsquo;t alter the problems he highlights with “Biblical Archaeology” in this article. Someone following old ,long discounted accounts to search for a long dead King despite the mainstream dismissing them as cranks,how stupid are they eh? So the first thing I read on this site dedicated to the exposure of bad archaeology is about as bad as archaeology gets. I guess you might disagree if you are in the habit of measuring yourself by the standards of Ancient Astronaut truthers, but if you submitted the above musings in any respectable archaeological seminar you’d be quietly asked to reconsider your career choice. The curiously silent James who seems to be responsible for this text has evidently never even read the article by Netzer, Porat et al. where you can find photographs of the “ten pieces of pretty stone”, and also quite a number of other pretty stones that clearly once formed part of a mausoleum of the kind usually referred to as nefashot. In fact, there were enough stones to reconstruct the entire structure in great detail (same goes for the sarcophagi). In addition to that, we are, you know, allowed to make inferences from the historical context: The site was first used by Herod the Great and we know from Joseohus that he is buried there. His heir Archelaos had the use of the place for only ten years before it came under direct Roman rule and he was exiled to Vienna, where he died. To sum it up, no royal burial at Herodium before Herod, no royal burial after Herod. So, once you find a royal burial place at Herodium, it is rather more than speculation to say it is that of Herod. If your ambition in life is to tell people that that pick-axe from Texas is not 12 million years old, it may be enough to read a newspaper article on the subject. If you want to have an opinion on a real archaeological topic you need to do a bit more.